Centaurs are small objects that populate our solar system roughly between the orbits of Saturn and Neptune. For many decades, their identity has proved a bit of an enigma to astronomers. Are they comets or asteroids? Apparently, it's all a question of where they originated from. Either they came from deep space - in which case they would be comets, or from our own solar system, making them asteroids. This explains the origin of their name. In Greek mythology, a "centaur" was a creature that was half man half horse - a hybrid. So, how are they defined? Again, that's a matter of contention. Various astronomical organisations have differing versions. One things they're all agreed on is that their orbits must be within that of Neptune. Another agreed criterion is that their orbits are irregular and must cross that of at least one of the gas giants at some point during their lives. It is known that comets have a coating of soot, or charcoal, meaning they don't reflect light very well and thus appear quite dark. Asteroids, on the other hand, are shiny, reflecting light in similar manner to our Moon. A recent mission by NASA's Wide-Field Infrared Survey Explorer (WISE) revealed that, out of the 183 centaurs listed by the Jet Propulsion Laboratory, around two-thirds displayed features similar to comets. Despite this, it is still not clear as to the identity of the other one-third. It was also discovered that there was some variation in the colour of these objects. Astronomers expected them to be blueish-grey. They actually found some that were blue-green and rusty red. This was quite a surprise and a tentative explanation for this could be that some of them originated from the gas giants. Though most of these objects have a designation that is an uninspiring sequence of numbers and letters, some of the more prominent ones have been assigned actual names. In Greek mythology, Chiron was the original centaur, so this object, discovered in 1997 and displaying the characteristics of both a comet and an asteroid, was named after him. It displays a very eccentric orbit, taking it within the orbit of Saturn and outside that of Uranus. One such orbit takes just over 50 years. Its diameter is currently estimated at 145 miles. It is thought that it originated from the Kuiper Belt and, sometime in the next million years, will become a true short-period comet. The second to be discovered, in 1992. This 115-mile-diameter object also displays an extremely eccentric orbit of around 92 years. Like Chiron, this orbit takes it within that of Saturn and outside that of Uranus. 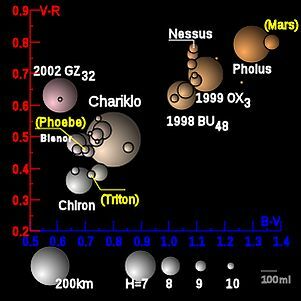 Pholus displays a bold red colouration and is also thought to have originated in the Kuiper Belt. The third to be discovered, in 1993, the orbit of Nessus takes it within that of Uranus and far beyond that of Neptune, into the Kuiper Belt. This 38-mile-diameter object orbits the Sun in 122.4 years. 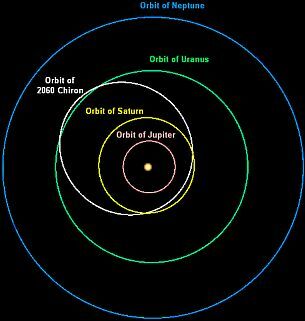 Discovered in 1995, this 80-mile -diameter centaur's orbit remains within the orbits of Jupiter and Neptune. Passage around the Sun takes it 76.88 years. In 1998, the Hubble Space Telescope reported the detection of an impact crater on its surface. Also discovered in 1995, Hylonome is a mere 43 miles in diameter. Its orbit crosses that of Neptune and, at the other extreme, grazes that of Uranus. One journey around the Sun takes it 126 years. With a diameter of around 160 miles, this is the largest of the centaurs. Discovered in 1997, it stays within the orbits of Saturn and Uranus and takes just over 64 years to get around the Sun. It has been discovered to have a surface consisting of water ice and has a comparatively stable trajectory. This object, around 128 miles in diameter, stays within the orbit of Neptune and just crosses that of Uranus. One journey round the Sun takes 67 years. It was discovered in 2000. This body, discovered in 2002, has a diameter that is a mere 47 miles. Its orbit grazes that of Neptune and passes well within that of Uranus. One such orbit takes 126 years.